Healthcare reform has emerged as a central issue between Hillary Clinton and Vermont Sen. Bernie Sanders in the hard-fought Democratic presidential campaign, and for now Sanders appears to have the upper hand. Their differences were on full display during Sunday night’s Democratic presidential debate in South Carolina, where Sanders touted his bold proposal for a universal government healthcare program while Clinton argued for staying the course and building on the Affordable Care Act. With only two weeks before the Iowa caucuses formally kick off the campaign season, a majority of Democrats and Democratic-leaning voters are siding with Sanders over Clinton, according to a new Morning Consult poll. Fifty-two percent of all Democrats surveyed say they prefer a government-run healthcare system to “a system where most Americans get their health coverage through a private insurance company,” according to Morning Consult’s Policy Index. 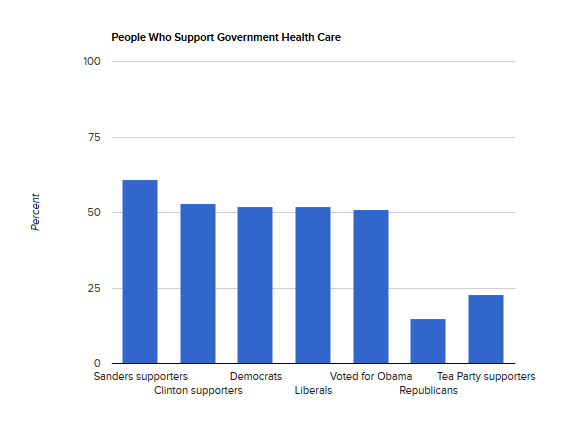 Among Sanders supporters, 61 percent embrace his national health insurance plan despite its nearly $14 trillion price tag over the coming decade and wide-ranging increase in taxes; 53 percent of avowed Clinton supporters also support the plan. Sanders, the self-described democratic socialist, unveiled details of his plan shortly before the debate. His proposal – a form of national health care not unlike those in Canada and Great Britain -- would supplant Obamacare and other government-subsidized programs with a “Medicare for all” program that provides coverage for all Americans. Sanders supported passage of the Affordable Care Act, which provides government subsidies to lower income people who purchase private insurance coverage on federal or state-run insurance exchanges. However, Sanders argues that even with millions of previously uninsured Americans obtaining coverage under Obamacare, it’s still not enough because it leaves 29 million Americans uninsured or stuck with excessive premiums and co-payments. Under his proposal, individuals who make $250,000 to $500,000 a year would have a federal income tax rate of 37 percent, according to The New York Times. A top rate of 52 percent would apply to those earning $10 million or more annually, which would cover an estimated 13,000 households. However, just about every taxpayer would feel the effects of a tax increase. Sanders contends his proposal would save $6 trillion over 10 years compared with the current system, in part because Americans no longer would have to pay premiums to private insurers and the government would have greater leverage to control health care costs – especially the price of prescription drugs. With Sanders leading in New Hampshire and closing in on Clinton in Iowa, the former secretary of state is portraying herself as a defender of President Obama’s legacy. She argued against jeopardizing Obamacare with a grand scheme like Sanders’s that probably couldn’t pass Congress but could give Republicans an opening to attack the Affordable Care Act. Clinton’s health care plan operates within the framework of Obamacare, but with changes that focus on expanding coverage and reducing out-of-pocket costs for consumers. She, like Sanders, has attacked major pharmaceutical companies for price gouging and has vowed to take steps to limit or rein in drug prices. Clinton’s problem is that while many Democrats support the Affordable Care Act, there is little enthusiasm for it. And many liberals are excited by Sanders’ more revolutionary approach, even if the proposal has next to no chance of getting past Republican majorities in Congress. But there is one ray of light for Clinton in the latest survey: Should she manage to win the Democratic presidential nomination, her practical approach to preserving the current health care system has broad appeal among all voters – Democrats and Republicans alike. Among all registered voters, 51 percent say they prefer a private health care system. Only 34 percent of registered voters support coverage through the federal government. A new Wall Street Journal/NBC News poll released over the weekend shows Clinton leading Sanders by 25 points nationally among Democratic primary voters, 59 percent to 34 percent, with former Maryland governor Martin O’Malley receiving just 2 percent. However, Sanders has shown remarkable strength on the campaign trail and in raising funds, and is threatening to sweep the first two major events of the year – the Feb. 1 Iowa caucuses and the New Hampshire primary later in the month. Should that happen, then all bets are off on Clinton’s longer-term prospects for winning the nomination. Part of Sanders’s allure to liberal Democrats is his promise for dramatic change in policy and the political system, while Clinton for many represents experience and the status quo. Overall, 61 percent of all voters want change, while 36 percent prefer experience, according to the Wall Street Journal/NBC News survey.